Just returned from St. George and examined the equipment you dropped off at my home. Your Heaps pack is a work of art. No problem putting in the pack frame unit, just copied the placement from the other pack. It's obvious you've put some thought into this gear. 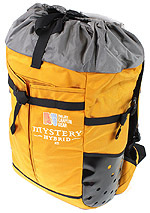 Nice to have a specific canyoneer's backpack like these are. 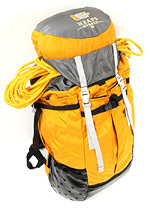 Much nicer than the inadequate little canyoning packs Petzl and Edelweiss are selling. 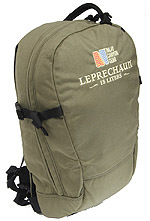 Much nicer than an ordinary backpack with grommets. 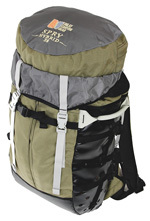 And much more durable appearing/better designed than my old Vaude canyoning backpack. These Heaps packs appear very rugged and look like they will last a good long time. I'm going to have some fun with these this year! Thanks for all the great service. Go anywhere, do-everything. 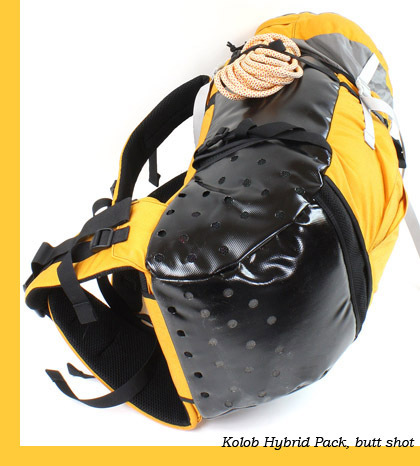 That's the idea behind the Kolob pack, the most versatile of Imlay's technical canyoneering packs. Big enough to carry pretty much everything needed for a big day out; small enough not to get in your way (except in the real skinnies). Carries nice. The Hybrid design applies differently to different sizes of packs. The 18 oz PVC laminate is considerably heavier than the 11 oz Cordura. Smaller packs, where the weight penalty is less of an issue, get more armor. The Kolob is armored on the sides and bottom, and has a pleated pocket on the back that works as armor. The Kolob's suspension is simple yet sophisticated. Two aluminum tubes provide a rigid vertical structure, which are tied into the pack via six-inch-tall sheet-plastic panels at the top and bottom. The structure is separated from your back by 3/4" of closed cell foam. The tubes are straight, though some degree of curve is built into the shape of the pack. A sumptuous full wrap-around hipbelt ties the bottom of the pack firmly to your hips. 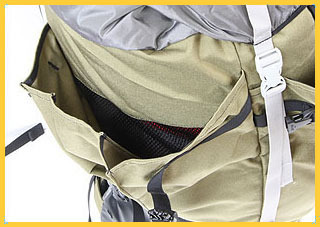 The hipbelt and the shoulder straps are lined with comfy, nylon 3-D mesh. 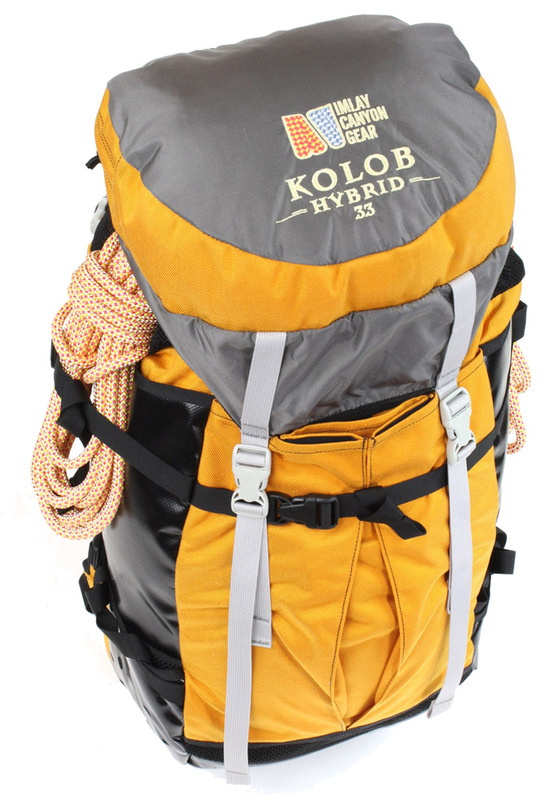 The volume of the Kolob body is about 27.5 liters, and the lid, our standard pack lid, is 4.7 liters. A pleated back pocket adds to the carrying capacity for the approach, but doesn't work well in-canyon because things can fall out. It is sized to fit a helmet. Behind the pleated pocket is 13oz Mesh, which aids drainage. Inside the pack, a mesh watertank pocket against the back can be used to hold objects under tight control against your back. I don't like using a watertank in technical canyons, but I often put my waterbottles in the mesh pocket, to keep them tight to my back for best carry, and so I know exactly where they are when I need a drink. For watertank fans, there are slots for the tank-tube to exit above the shoulders. The back foam panel removes and unfolds for those unexpected canyon bivies. Imlay pack handles are big and easy to grasp, and stout because we canyoneers rappel with the pack, and often need to dangle the pack from the handle. 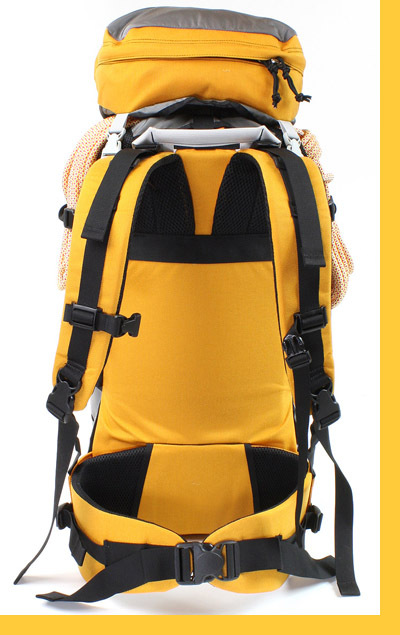 The shoulder straps use a quick-release buckle so that when stuck with the pack on your back, the pack can be easily jettisoned. Not recommended as a regular activity, but once in a while this proves useful. 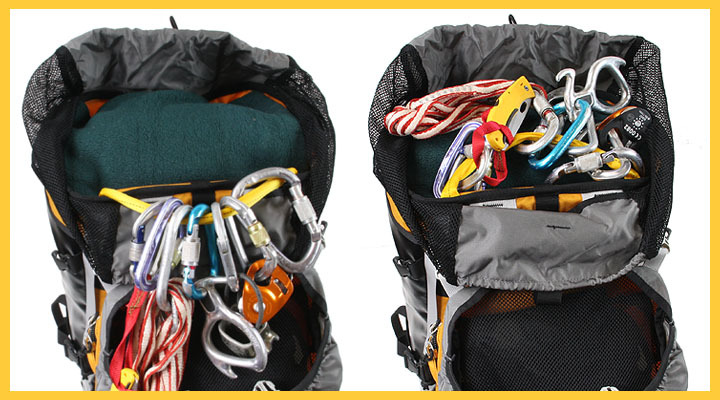 Inside the pack, a handy "rack" keeps your technical gear handy when needed in-canyon. The gear can be flipped out of the way for packing and unpacking. 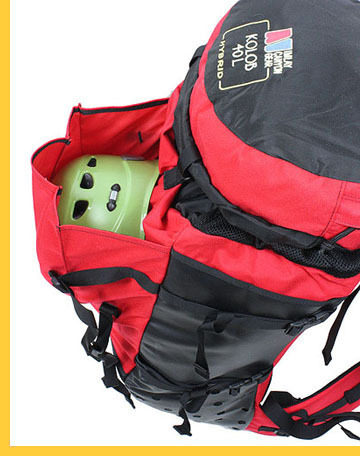 The "Volume" number stated by manufacturers is a way of communicating the volume of the pack, and has traditionally had only a remote attachment to physical accuracy. I chose numbers based on my experience as pack manager at Black Diamond, where we did actually measure pack volumes using plastic balls. In Fall 2010, I bought a set of balls (I know, I know) and actually measured the packs, so the current stated volume is accurate, though it may not reflect the same size as stated volumes from other manufacturers. The stated volume does not include the pleated pockets. I am "X" tall. 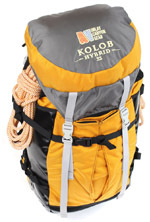 Will the Kolob pack fit me? The Kolob fits well men from about 5'6" to 6'0" who are HWP. Beyond that, the fit is less good. The frame height is 20". Because the suspension does not have a shaped, rigid structure, the fit range is broader than many other packs. Whether it meets your requirements for a good fit is up to you. The buckle on my hipbelt broke. Can I get it fixed? Under warranty? Where should I send it? We can, but if it is just the buckle, it would be great if I can just send you a new buckle. It CAN be installed without unstitching the pack, though it usually takes some time, ingenuity, patience and a pair of neele-nose pliers. If you have access to an industrial sewing machine, it is often easier to slit the stitching that holds the end-of-strap clump with a razor blade, slide a new buckle on and restitch the clump. What "known problems" are there on the Kolob Pack?